Your first guitar lesson is FREE if you don’t love it! 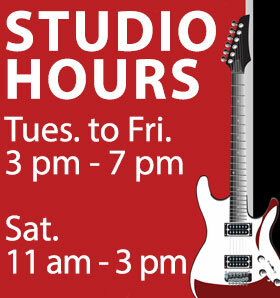 Call (504) 559-5229 for your guitar lesson today. If you don’t love it, consider your first guitar lesson your free guitar lesson. FREE if you don’t continue lessons. No one has ever left our studio without signing up for more lessons! You will learn all of this by learning to play the songs and progressions given in chapters three through eight. There are no exercises in this report. The songs are the exercise. The reason the number of chords and strums varies depends on the style(s) of music you want to play. No, not in this book. While music notation can be helpful, and is necessary for classical, jazz, and professionals, that’s not our goal. You will learn to read a chord chart and some basic rhythm notation. You will also learn to read tablature, an extremely easy way to read guitar music. Twenty minutes a day six days a week is way better than two hours all in one day. You are building a physical reflex, not cramming for a test, cramming won’t work. Give yourself a day off too; six days is enough. If you are a complete beginner, I would learn to play right-handed. After all, you have to use both hands to play, and the left hand does most of the work. Left-handed guitars are also harder to find and cost a little more. If you already have a left-handed guitar or you just can’t stand the idea of playing right-handed, go ahead and learn left-handed. Since this book is for right-handed people, you will need to reverse the pictures, so please go slow and pay attention to string and fret numbers. What type of guitar should I get? Where? Where do I buy a guitar? A beginner should buy at a local music store. While mail-order, pawn shops and big box stores can be cheaper, they won’t help you if your guitar breaks or show you how to use your tuner. A good store will find time to talk with you if they aren’t busy. If they won’t talk to you, find another store. The only two exceptions to this rule are if you have an experienced friend to help you, or if you live in an area with no music stores. In that case, mail-order/internet is your main option. What type of guitar should I buy? Don’t spend a lot! I recommend an inexpensive guitar; good enough to stay in tune, easy to play, and last for a year or more (maybe forever) until you outgrow it. Hence, you should get a decent guitar for $100 to $300, anything much below $100 is likely to be a toy. acoustic guitars: Also called box guitars, this is the way to go if your budget is tight. You can buy a decent guitar for as little as $100, although $150 is more likely, plus about $20 for a soft case. I would go for steel strings instead of nylon. electric guitars: It’s what the kids want, and a lot of adults too. A decent electric guitar runs about the same as an acoustic, $100 to $200, but you also need an amplifier and connecting cable, which can add another $150. You can often purchase a guitar/amp package for $200 to $300, which includes guitar, amplifier, case, and cable (ask and make sure it does). Pinch the Neck: Keep your palm away from from the neck and pinch it between your thumb and fingers. Don’t grip it like a rifle! Arch Your Fingers: Curl your fingers so the tips come down as straight as you can manage. Adjust One Finger at a Time: Don’t just whang away and wonder why it sounds so bad. Make the chord the best you can and play one string at a time, adjusting and re-checking for clarity as you go. Therefore, I am taking for granted you are already keeping your finger close behind the frets, pressing hard, etc. (Also, check your string gauge, they should be extra light!) If your fingers are big, your sweet spot for a clear chord may be millimeters, but you can do it. It’s easier to watch this than read it, so check out the video to the above! These free guitar playing hints are straight from the questions and answers in chapter one of my book, No Fail Guitar, available here from Amazon.